Edit PDF Files easily with Various easy ways without Adobe Acrobat by using Online PDF editing service, Apps, Using Google Docs, PDF elements, PDFpen and Text and Images of your PDF file in the Browser…. Portable Document Format (PDF) refers to a format of a file that is made to consistently present documents across multiple platforms and devices. It is one of the widely used formats all over the world. It is mainly used for exchanging and saving documents. It has the ability to save a lot of data such as vector graphics, formatted text and raster images. Many people like using this format because it is standard in such a way that the document looks the same in all devices and programs used to open it. For instance, if one saves a PDF file on a Mac, while open in windows, IOS or Android will still appear the same. This format also supports metadata and it is also capable of storing embedded fonts. One can also be able to encrypt the PDF documents so that only the authorized persons can be able to open them. However, most people find it difficult to edit a PDF file after saving it. There are several ways in which this can be done. Acrobat is software that is commonly used to export, create and edit PDFs. It was created by Adobe. Most people refer to it as the most powerful solution to PDF in the world. However, its relatively high price keeps many people off. But this does not mean that they are unable to edit their PDF documents since there are several other ways of editing it, as discussed below. This method is used to edit documents that do not contain confidential or sensitive data. One needs to upload the PDF file to the server of the chosen service provider and will be able to edit the file instantly. PDFescape is one of the servers used to edit PDF files. It is free of charge and allows the user to annotate, edit and protect the password of any PDF files. One can also create a new form or just fill the existing forms. However, this service is limited to up to 10 MBs and 100 pages. 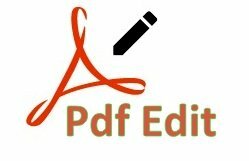 PDFBuddy is also another server used to edit PDF files. It is also free of charge and it enables one to edit and the PDF files and sign them as well. However, the user must sign up before saving any changes. The user is also limited to uploading up to 3 PDF files only each month. Mac gives a chance for their users to be able to make changes to their PDF files. Creating/adding the signature to a file, deleting or adding pages, highlighting, annotating and merging PDF files are some of the changes that a preview app on Mac devices can allow the user to do. This app can be installed in any modern OS X, macOS Sierra being included, by default. This means that one does not have to re-download it. The app is intuitive and easy to use. The Google Docs can allow one to change a scanned PDF file into editable text. This is achieved by one signing into Google Drive and uploading their PDF file. The person is then required to right click on it and chose to open with Google Docs. By doing so, one is able to edit the file directly and make the desired changes. Once done in making the changes, the user is supposed to click on the File, select download as and then select the PDF document as the output format. A PDF element is similar to Acrobat and offers similar features but at a cheaper price. This software suite has several useful tools that enable one to convert, edit, organize and combine PDF files professionally. It also has an Optical Character Recognition technology that allows the user to change scanned PDFs into searchable and editable texts. This application can be widely used since it is compatible with Macintosh, Windows and iOS platforms. A PDF pen is like a pen that allows the user to edit PDF files effortlessly. It is more powerful than the preview app when it comes to PDF files editing. It helps the user to do all the basic and advanced PDF editing more efficient. However, this software is only compatible only with Mac OS X 10.7 or above, and macOS Sierra. This can be achieved through the use of a word app. However, the app is not capable of handling PDF files that have complex layouts. The PDFs that are mostly comprised of images and charts can also be challenging to edit using this app. However, text-based PDF, the app can help in fixing the manipulating text, typos, and images in the PDFs. For this to be achieved, the following steps are followed for Edit PDF Files. One should go to onedrive.com and sign in with their Microsoft account. Drag the PDF file from where it was initially saved to the OneDrive website and upload it. The document should then be opened in word online app. The next step should be clicking on the “edit in word” button. This should open the PDF file for editing. One should ensure that they allow OneDrive to convert the document from the PDF into word format when it asks for permission to. One should then click the edit button to open the already converted document for editing in the Word app. This allows one to edit the document, change the logo, add images, apply different formatting, and modify the text and adding the tables among other things. When done with editing, one should select the file menu, choose “save as” so that they can download it as a PDF file again. OCR with Google Docs is also a similar option used to edit text and images of the PDF file in the browser. This option is available in Google Docs but it is not enabled by default. It is found by one going to Google Docs settings and turning on the “Convert uploaded files to Google Docs editor format” option. The PDF file is then uploaded to Google Drive, then click on the “Open With – Google Docs” option found in the contextual menu. PDFs being the best file formats that people in business and organizations use, there is a huge necessity for the users to be able to edit and manipulate these files so that they can be able to complete important projects. At times, people need to edit these files from their working place, which is not necessarily in an office. Different PDF editors for iPad and iPhone are now in place to enable people to edit their PDF files from their area of work. It is a free PDF editor for iOS. It provides the user with a robust PDF solution. PDF converting to nine formats, word editing, PDF annotating and PDF file management are among the many solutions offered by this app. The program is useful mainly in annotating PDF documents. It enables the user to highlight, strike-through, underline and draw on the PDF file. PDF Expert. It is a great PDF editor in mobile phones for annotation and PDF organization. Additionally, it gives the user a great experience while reading. It is also used to annotate the document, edit text and add a digital signature to PDF files. The app is very easy to use and it allows the user to create, edit and read PDF annotations. Additionally, it supports management of files by cop, moves, renames and transfer folders and files. It also allows excel, word, TXT, HTML, and PowerPoint. Adobe Acrobat Reader. There are both Desktop version and iOS app for Adobe Reader. The iOS app version is light and agile. It has a number of features that enable the user to annotate a PDF file as they read. One can be able to fill forms, highlight the file, password protect PDF files and sign in documents. Many institutions such as banks send statements such as credit card statements as PDF files that are password-protected. They do this because the document contains personal information and it is not supposed to be publicly exposed to anyone who can access such documents. Even after inserting the password and accessing the document and closing it, it will still ask the user to insert the password again so as to be able to access the file. This ensures that the information contained in that document is secure all the time. However, sometimes it becomes so stressing when one wants to access such documents and they have forgotten their password. Due to this reason, Google Chrome enables people to be able to remove passwords from PDF files. It is safe and secure to remove password before uploading PDF files documents to Drive since Google Drive is protected with 2 layers of the security password. It also has a 2-factor authentication. Google Chrome work with both Windows and Mac. It has a PDF reader that is inbuilt and a PDF writer. When the two features are combined, they make it possible to remove a password from all the PDF documents. The following process should be followed to remove the password. The PDF password protected file should be dragged to the Google Chrome browser. The password should be entered to open the file. Once it is opened, select the file menu in Google Chrome. Select the print option and choose a printer destination as “Save as PDF.” The save button should then be clicked. The document will be saved on the user’s desktop without a password protection. The document no longer asks for a password when the user tries to open it. The term OpenOffice refers to an office suite of applications which are like Microsoft office or Coral office suite. In general, an Office Suite of applications contains a word processor, a presentation manager, a spreadsheet and few others. Unlike the latest version of Microsoft Office, Apache OpenOffice is free of charge. It enables one to open and edit all documents contained in Microsoft Office. OpenOffice and Microsoft Office are perfectly compatible with each other and there are no problems experienced. It is available both on Mac and on Windows. This makes it more efficient and accessible to many people since both groups can be in a position to enjoy the amazing feature that comes with this product. Although it might not be having all the features that come with the Acrobat, it is capable of satisfying almost every user’s needs which only requires basic editing. PDF files being the most used type of files formatting; it is secure since the documents cannot easily interfere. This ensures that the document originality is well maintained and secured. However, as a human is known to commit errors from time to time, it is also possible to commit errors on a PDF formatted file, hence requiring for editing. Most people only know to use Adobe to edit such document, which relatively expensive. This article discusses several other cheaper ways that can be used to edit such documents. It helps in ensuring that people can now use PDF files more comfortably and conveniently.